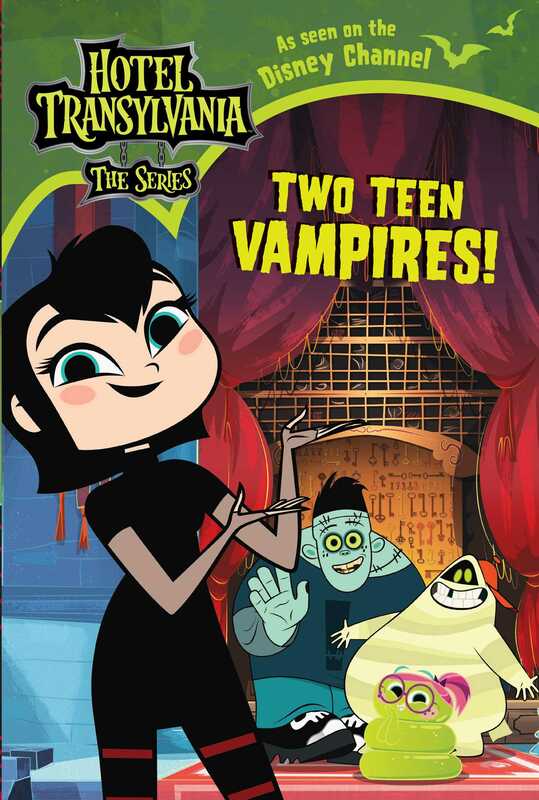 Mavis accidentally makes her Aunt Lydia young again in this hilarious novel based on an episode of the hit Disney Channel show Hotel Transylvania: The Series. Aunt Lydia is ruining the afterlife! Mavis and her friends really want to go to Roachella, the biggest concert of the year, but strict Aunt Lydia says no. If only Aunt Lydia were a teenager, she’d understand just how cool Roachella is! That’s when Mavis gets an idea—she can use Uncle Gene’s zombie sprayer to make Aunt Lydia young again! Sure enough, Teen Lydia isn’t so uptight—in fact, Teen Lydia is, well, cool. So cool that she no longer wants to run Hotel Transylvania. If everyone goes to the concert, who will look after the hotel? Will Mavis and her friends make it to Roachella after all? ™ & © 2018 Sony Pictures Animation Inc. All Rights Reserved. Book Cover Image (jpg): Two Teen Vampires!